I have owned and driven many vehicles and the 2014 Mazda6 is by far the best of the lot. It looks and drives sporty, is reliable, comfortable and a good value when compared to other vehicles in it's class. After 33k, have had 3 recalls and a radar cruise control failure. Covered under warranty. Great dealer service. Ontario Mazda, Canangaigua, NY! I regularly get 33-34 mpg commuting 35-55 mph with some stop and go driving distances of 30+ miles each way. Constant speed driving on interstates through central PA, DC, VA, CT, RI, with seldom slow traffic backups, the car gets 36-37 mpg. Usually set at about 3-4 miles over posted or at traffic flow speeds. This is not a boulevard-cushy riding quiet car like your Grandpas Caddy, but a tied down smooth riding car that communicates some road and engine noise into the cabin. The engine sound is sporty-sweet but muted on the inside. 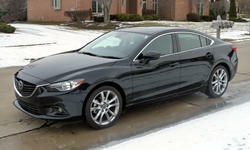 Why Not the 2014 Mazda Mazda6? For a Grand Tourer the car lacks door bins and dashboard cubbies that accomodate the usual travel stuff, like brochures, a log book, a newspaper, pens and pencils, cell phone, etc. The one big-gulp bin in the door and regular cup holders in the console would be handy if I had the need to drink that quanty of fluids while on the go, but I also have other needs. Mazda goofed by not providing a coolant temperature guage on the car but instead uses a dashboard blue-cold, red light blinking-warning, red light solid-hot, to indicate engine coolant temperature. I keep track of engine cooling and like an old fashioned coolant guage with gradients and degrees. I think Mazda drivers, especially, like to monitor engine functions. Mazda drivers let your preference be heard on this one. The other controls and instruments are ok. The bluetooth is seamless, and understands my voice well; the speech recognition for the Nav system is over the top hillarious in what it thinks I said. The dashboard knobs, the touch screen and the touch elements need to be larger for my big fingers. The driver's seat in this car is comfy for short and long trips and adjusts adequately for the short and tall drivers of the car. The steering wheel's adjustments in and out and up and down are there and needed. Tall passengers have difficulty getting comfortable in the front passenger seat, it needs bottom cushion tilt and raise ability like the driver's seat. The door arm rests are too far away from where the normal person's elbow rests. A person will havfe to lean into the door to use them. The center arm rest is located properly. Visibility out the passenger side windows and the rear is obstructed by the large roof pillars between the doors and out the back. The backup camera use is a must on this car. Mazda, or someone, needs to come up with a camera eye cleaner for snow country customers. Mazda seems to have struck a balance between power and high mileage with this car. It is no tire burner for sure, and I want more torque at lower RPM. But the power is there; when you need to push it along just step on it. Small communities need our traffic ticket money these days anyway. The BOSE sound system gives great sound separation and level control. The Nav system speech recognition needs attention. The system has map and direction flaws in some urban settings. We could do without the 'info sharing' and safety messages EVERY time the system starts too. And, the graphics could be more refined, less pixillated. Look at the Soul Red exterior with red stitched black leather interior for maximum visual impact.